If you are over 60 like I am, you will probably know that caring for our aging skin can be a bit of a burden, to put it lightly. It sometimes seems like an uphill battle that can never be won. However it doesn’t have to be all bad, there is no reason why we can’t manage it the right way and grow old gracefully, and look good at the same time while we do it. I think our skin is of utmost importance here, especially on and around our face and neck. I mean really our skin is like the canvas of a painting. The better the condition that our skin is in, the less work we have to do with the paintbrush. I think moisturizing is the key here, and this is why I actively chase down the best skin moisturizing products I can find. As well as helping me look the best I can, having healthy hydrated skin also helps me feel the best I can. In this post I intend to share with you what I think are the best facial and general moisturizers that women over 60 can use to help their canvas be the best it can be. We are lucky enough to live in a time where advances in medicine and science are enabling us to live longer than ever before, and remain healthier and better looking while we do it. This excites me and I can’t wait to see what they come out with next. Imagine the moisturizers that will be available to us in 20 years time! So of course we all have quite different skin types – some oily, some dry, some neutral and and others with every possible combination of these that you could ever think of. I am lucky enough to have fairly neutral skin a lot of the time but often I get oily patches to the sides of my nose and dryness around my mouth. Thank you very much whoever is responsible for that! Anyway I guess my point is that the products I will recommend and review here seem to be able to deal with these different situations, so don’t worry if your skin is different – everybody’s is! I touched upon it earlier, but I feel it important enough to go over it again. Making sure our skin is in the best possible condition makes our life so much easier. I mean, the point of concealer and foundation is to make our skin look better, so the better condition our skin is in to start with, the less work we have to do in front of the makeup mirror! Time spent moisturizing is double time saved down the track if you ask me. There are a lot of good products available for moisturizing your face today. There are also a lot of bad and low quality ones too. Over the years I would say I have gone through many of both. 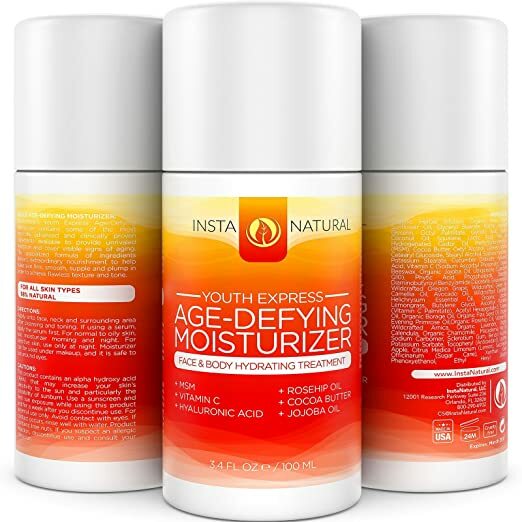 At the moment, my pick for the best facial moisturizer for women over 60 is the age defying moisturizer by InstaNatural. InstaNatural make a lot of great products and I think this one is great for older skin like mine. It has a nice thick consistency out of the pump but goes on really nicely and seems to absorb really well. I like that it doesn’t leave a residue like so many others do. It contains some powerful ingredients and I particularly like that it has a good amount of hyaluronic acid and rosehip oil. 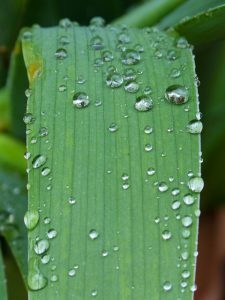 I think hyaluronic acid is magic and try to make sure it is in any skin care product I buy. Another selling point for me is that it has a pleasant and very subtle smell, but I would expect this from InstaNatural product as they like to promote how natural they are. 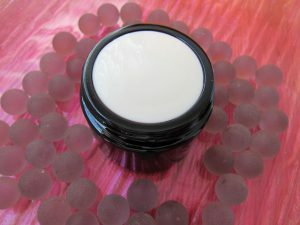 For a general body skin moisturizer another one of my favorites is the skin revitalizing cream by Pure Body Naturals. This is my pick for skin like on your hand, arms, legs etc. I mean, you could always use your face moisturizer on your body if you need to but I think it is better to use a facial moisturizer for your face and a skin moisturizer on the rest of your body. The skin on our face is obviously a bit more sensitive than our body and our body can handle more aggressive creams so I think it is better to use the products designed for that area. It is hard to conclusively pick any one product as the best skin moisturizer for women over 60 but there are several reasons why I decided to go with this one. It claims to naturally exfoliate and I think it actually does. When I wake up sometimes my skin seems like it has been exfoliated overnight which I find pretty amazing. It is possibly my favorite packaging ever too – it’s like a jar with a pump on top, you’ll love it. The smell is not overpowering either. If you have sensitive skin you are probably all too familiar with the bother of reacting with nearly everything you try. There are so many aspects to skin care products that can cause your skin to reject it – the SPF, the smell etc. Well if this sounds like you then the sensitive skin version of the Olay moisturizing lotion may be just what the doctor ordered. I don’t use it myself as my skin is rather hardy but one of my daughters has quite sensitive skin (thanks to her father!) and she swears by it. It’s not greasy, absorbs quickly and most importantly does not react with her sensitive skin. In my opinion the best skin care product if you have both sensitive and aging skin is this one. I guess it is not a big seller because she says it is hard to find in stores so she needs to get it online. However I don’t see this as much of a problem, it is as easy as a couple of clicks on Amazon. Thanks for looking at my posts about the Best Facial and Skin Moisturizers for Women Over 60 with Aging Skin. I hope you liked it! If you have anything to add I would love to hear from you either through my Facebook, Twitter or Google + pages, or also please feel free to leave a comment below. Thanks again for reading and have a great day! Video – How Does Moisturizer Work? ooo you do a good narrative my friend and although I have not yet reached the age of 41 and am a man I found your post to me encouraging to the ladies out there that are facing this problem but but know not what to do about it. A very good post indeed and I wish you the best of luck. Personally I feel that it was a very helpful and positive post leading to a possible solution. Thank you Simon, even though you may not need it now prevention is better than cure, especially when it comes to your skin! Hi Mary, How do you feel about products that are more naturally based, rather than with chemicals? I feel, now that I’m 60, the less chemicals I can put on my skin the better. Hello Di, personally I think natural is great but do not have a problem with chemicals. After all, everything in nature is basically just a combination of chemicals anyway!